On arrival at the event everyone can share their views, eat free hot homecooked food, view artworks, share ideas & memories, identify the challenges & propose solutions. Everyone is welcome! 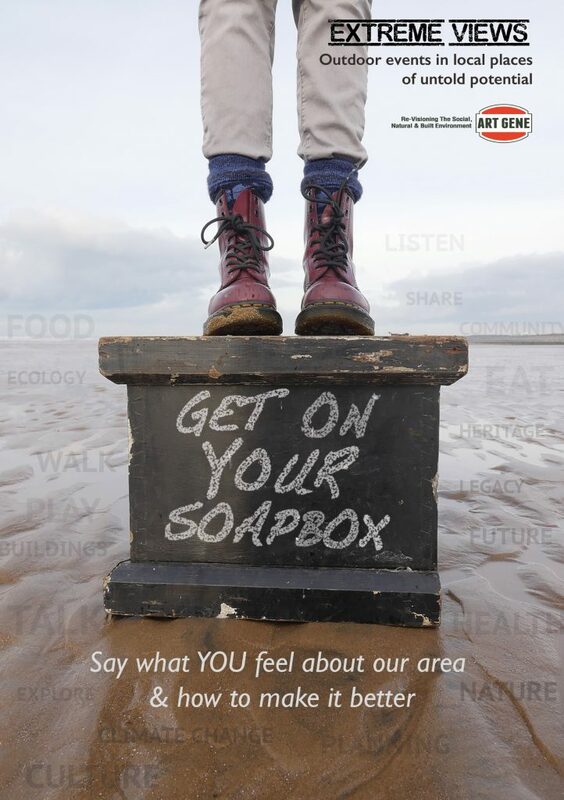 You will also be invited to speak for 60 seconds from the Extreme Views soapbox tower (and contribute written views anonymously) about your feelings & vision for the future of our area. Meet at Cavendish Dock Car Park, Cavendish Dock Road, Barrow-in-Furness, LA14 2XA. Meet at Askam ‘Pier’, near Victoria Street, Askam-in-Furness, LA16 7BX. Meet at North Scale Car Park, Teesdale Road, Walney Island, Barrow-in-Furness, LA14 3SE. Booking essential: call Ellie 01229 825085 or email ellie.chaney@art-gene.co.uk. Art Gene, Nan Tait Centre, Abbey Road, Barrow-in-Furness, LA14 1LG. Exhibition continues Tuesday 9th – 14th 11am – 5pm. FREE ENTRY. Sign up to our e-flyer for further information: www.art-gene.co.uk or contact Ellie below. Extreme Views exhibition goes to Boone’s Chapel, London 2019. Dates to be confirmed.